I've always been fascinated by the mixture of mechanics and electronics that you find in toys, and so Pixelh8's first solo exhibition needed little introduction - plus I know Pixelh8 from the excellent Ipswich-based 'Curiosity Collective' technology/arts group. 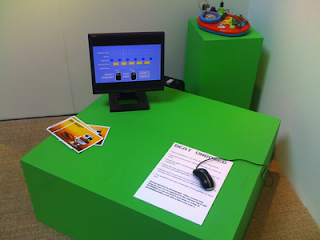 Titled 'Childhood Remixed', the exhibition is all about making sounds with children's toys, and the complete encompassing project also includes related workshops and talks. 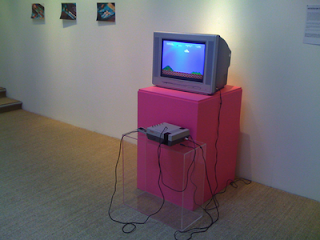 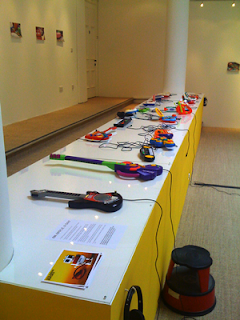 I've been to one of Pixelh8's 'circuit bending' workshops before and it was totally brilliant. 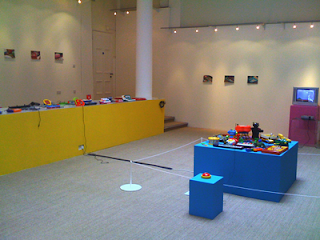 The exhibition has several separate exhibits, linked by a common theme of revisiting children's toys as an adult and looking at them with very different eyes and mindset. 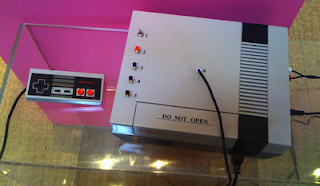 Warranty Void is an augmented Nintendo NES console from several generations before the the Wii and people waving Wiimotes took over the video games console market. An Apple A Day takes toys and leaves the brightly coloured plastic exteriors alone, but subverts the audio internals in ways that range from subtle to extreme. It has to be said that one of the characteristics of circuit bending is that the resulting modifications tend to veer to the more overt end of the spectrum. 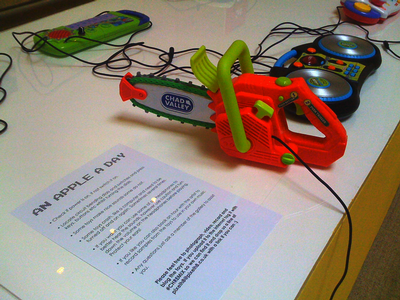 My personal favourite (a quote from Zorg, of course) was the chain-saw, possibly one of the most unusual musical instruments I've seen as a children's toy, although some heavy metal rock bands have used angle grinders in performance, more for sparks than sound, and I noticed that this year's Eurovision Song Content featured a robot with an angle grinder in one of the performances too, so perhaps this type of industrial ephemera is becoming more mainstream. 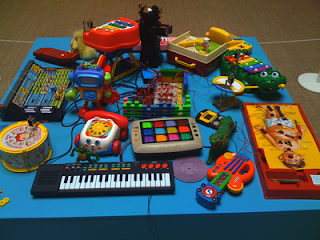 Beat Un-boxed took cute and turned into into a beat-box. 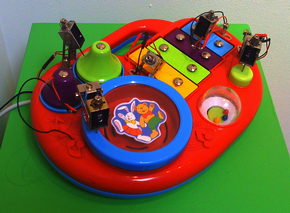 A 16-step sequencer driving a multi-instrument percussion set via solenoids - gorgeous! 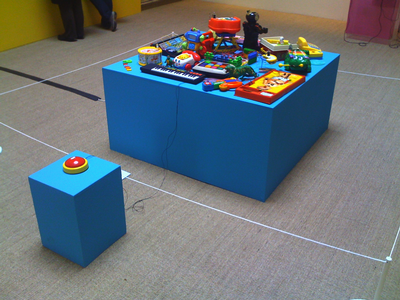 The centre of the exhibit is dominated by a piece of musical autonomata set off by a big red button. 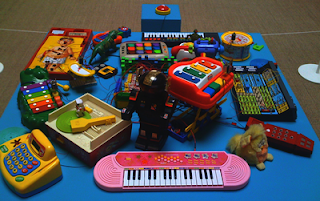 Robots, Meccano and more plastic combine to make a visual and audible melange. 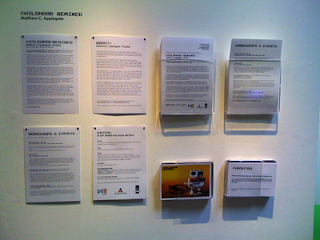 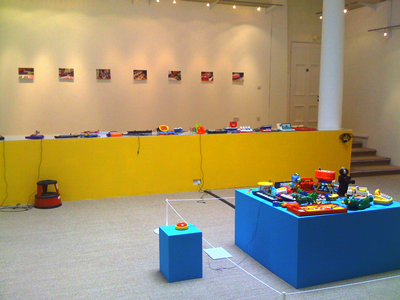 'Childhood Remixed' is open to the public from May 29th to July 12th, 2010 in the Town Hall Galleries, Ipswich, Suffolk, UK. Thoroughly recommended.